On November 6 the FIA World Endurance Championship is having its eighth and, at the same time, penultimate round of the 2016 season. One year ago in Shanghai Porsche celebrated an early win in the manufacturers’ world championship. Nothing less than the defence of this title is the target for this year’s six-hour race at the Chinese Formula One circuit. So far this season the Porsche Team has achieved five race wins with its two 919 Hybrids and leads the manufacturers’ world championship with 263 points ahead of Audi (204) and Toyota (174). With the current advantage being 59 points, the team could start partying if the gap was at least 44 points after six hours of racing. Porsche very much regrets the loss of Audi as a great competitor from the 2017 WEC season on. Porsche will compete in the entire 2017 WEC season as planned. So far Porsche has derived a huge benefit in terms of knowledge and innovations for production cars from the LMP1 programme – this applies in particular to the 24-hour race at Le Mans. In the drivers’ world championship, the trio of Romain Dumas (FR), Neel Jani (CH) and Marc Lieb (DE) top the standings with 140 points ahead of the best-placed Toyota (117) and Audi drivers (111.5). To secure an early title win, Dumas/Jani/Lieb would have to extend their current 23-point advantage in Shanghai to 26 points. 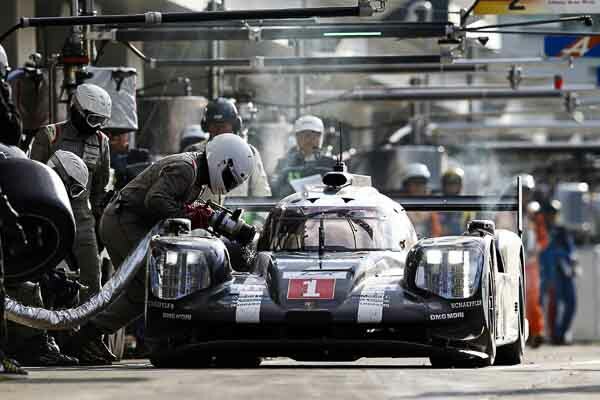 The crew of the sister Porsche, Timo Bernhard (DE), Brendon Hartley (NZ) and Mark Webber (AU), has 93.5 points to its tally and ranks fourth. The Weissach developed Porsche 919 Hybrid produces a system power of over 900 HP (662 kW). Its combustion engine is a ground breaking downsizing motor: the very compact two-litre V4 turbocharged petrol engine drives the rear axle with almost 500 HP (368 kW). Two different energy recovery systems – brake energy from the front and exhaust energy – feed a lithium ion battery that, on command, passes on the energy to an E machine to power the front axle with an extra boost of over 400 HP (294 kW).